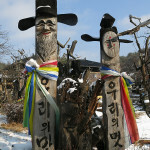 The greeting committees entering the Hahoe Folk Village area. 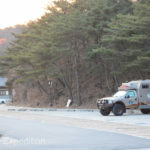 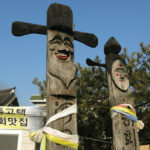 Driving into the Hahoe Folk village visitor parking area where we would camp for a couple of nights, we noticed some interesting woodcarvings and Korean style “totem poles”. 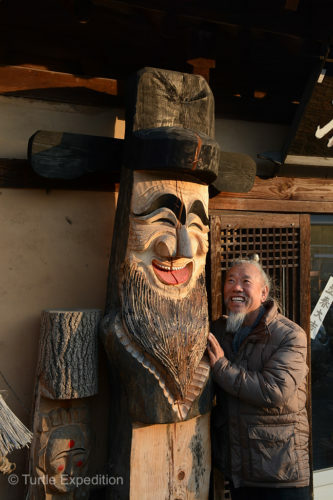 Mr. Kim Jong-heung had just finished this carving. 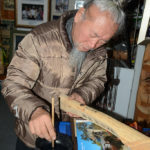 We later met the artist, Mr. Kim Jong-heung, who, as it turns out, is quite famous, having presented his works to Queen Elizabeth II on her 73rd birthday and even to both Presidents Bush. 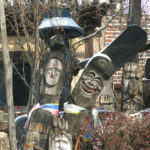 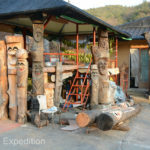 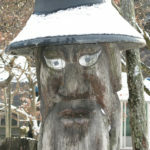 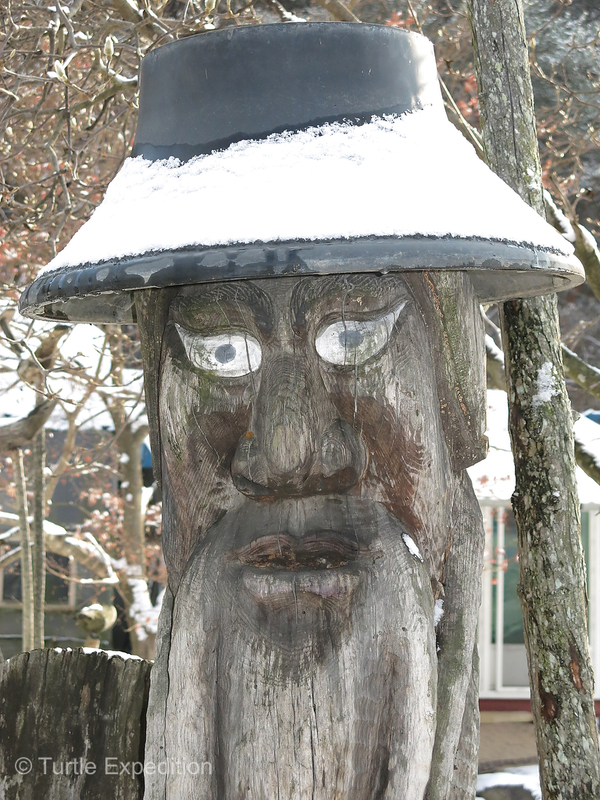 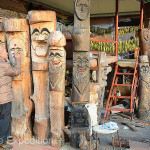 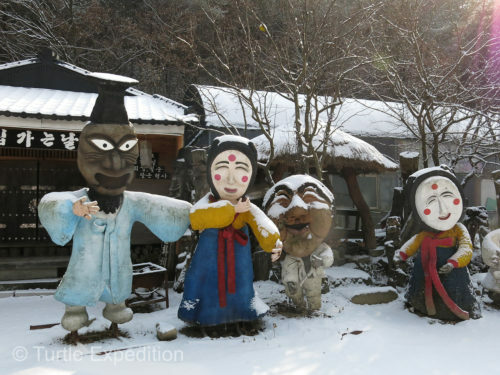 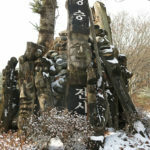 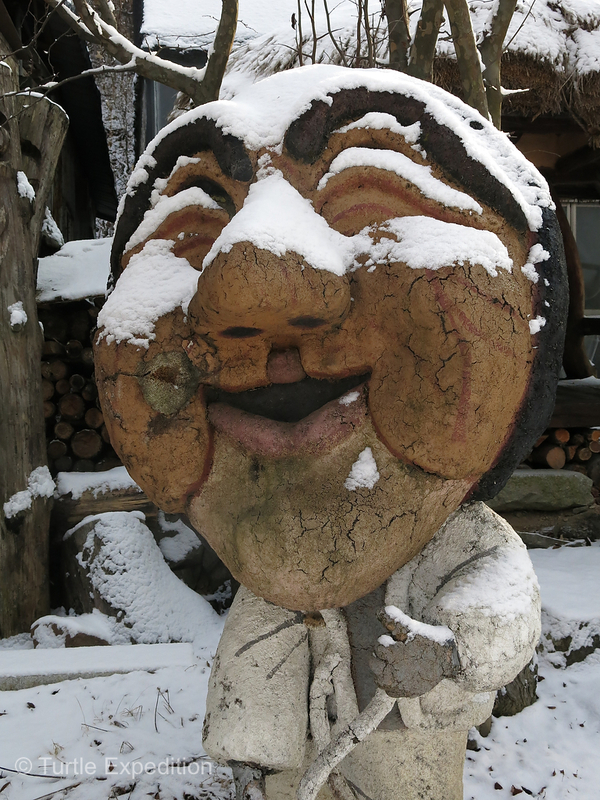 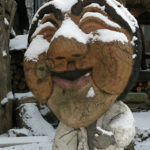 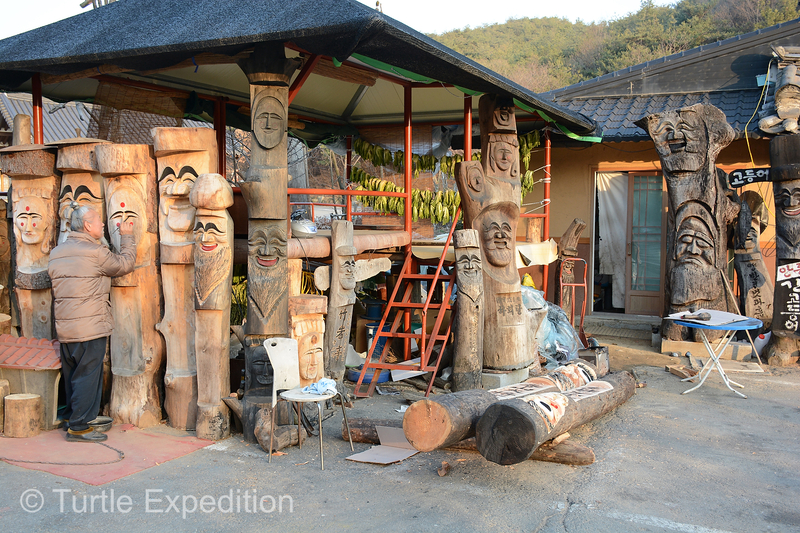 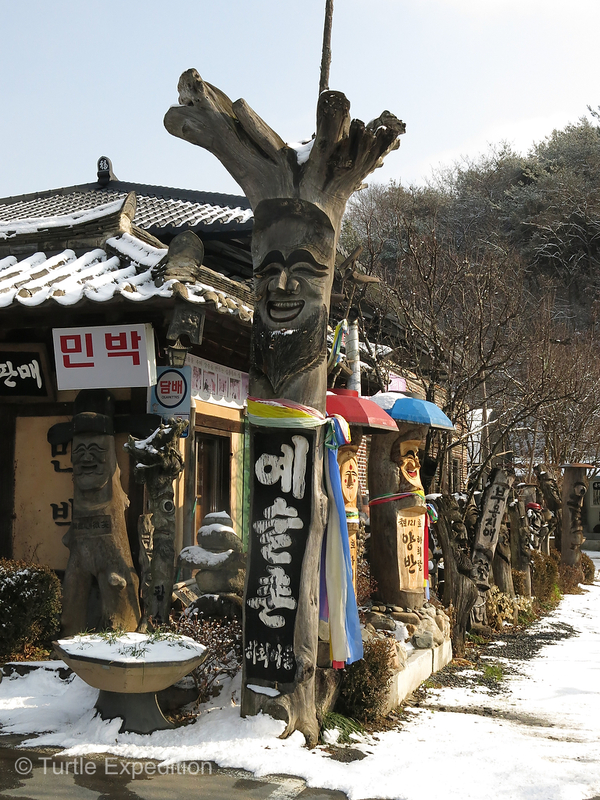 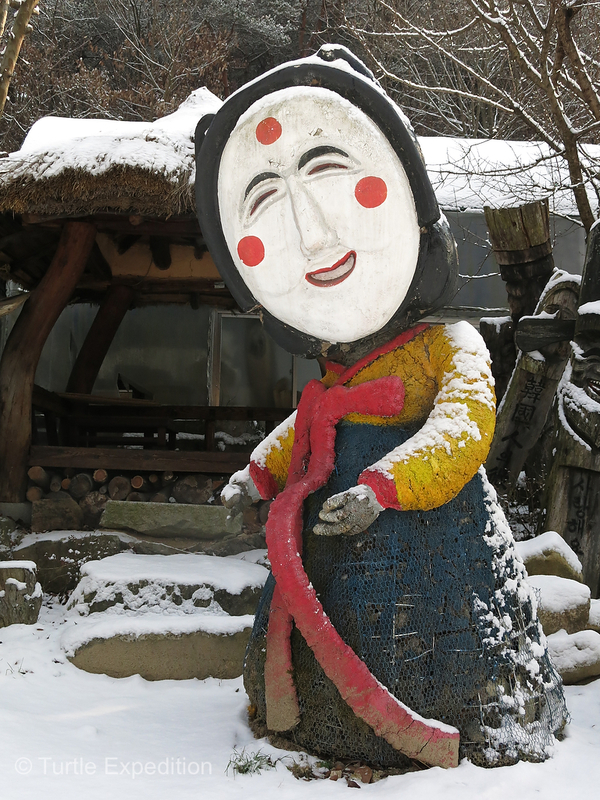 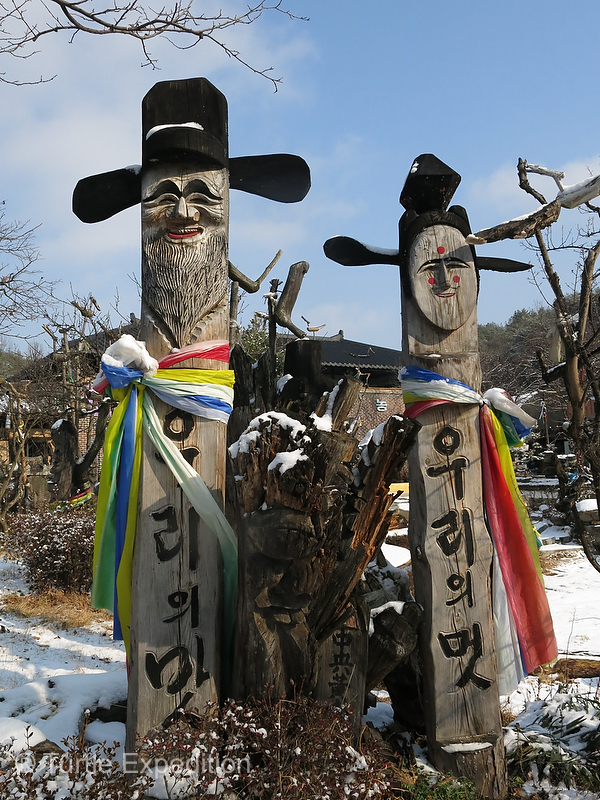 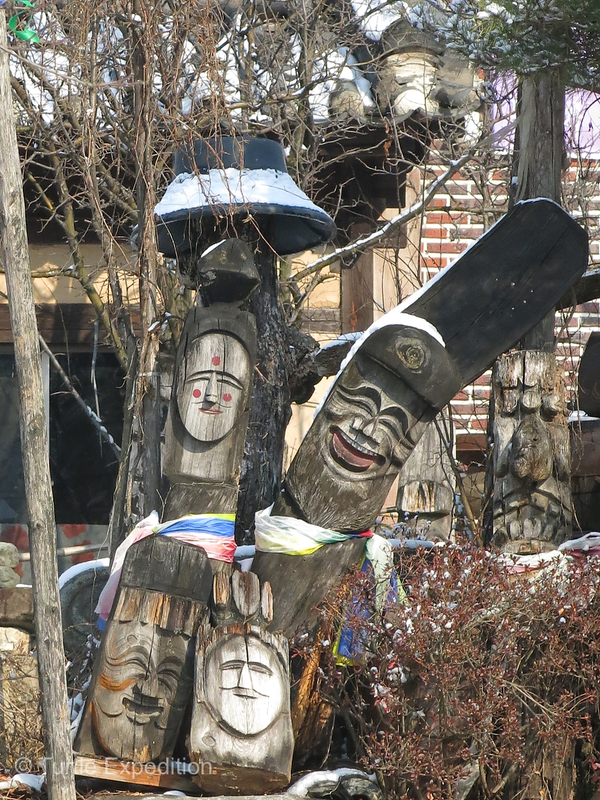 Throughout Hahoe you stumble upon a variety of interesting wood sculptures. 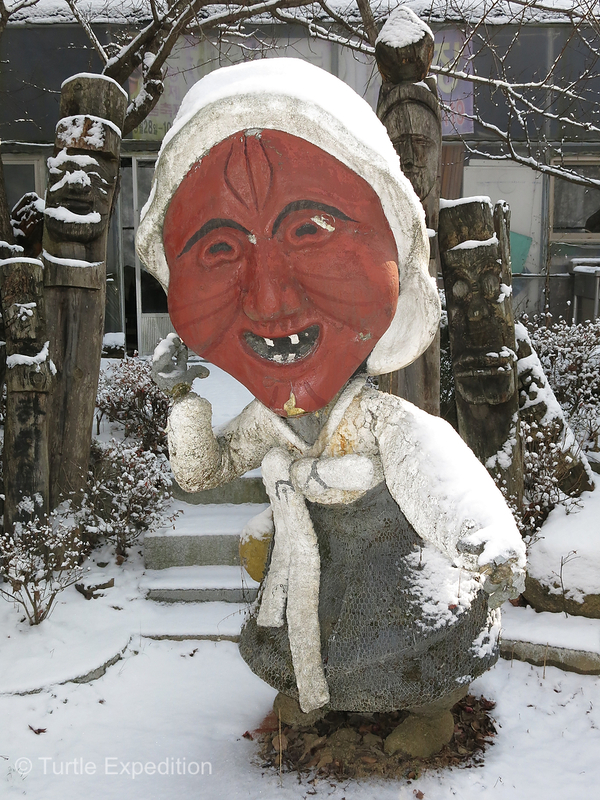 We do not know if Mr. Kim Jong-heung created them all but many seemed to have his subtle creative touches. 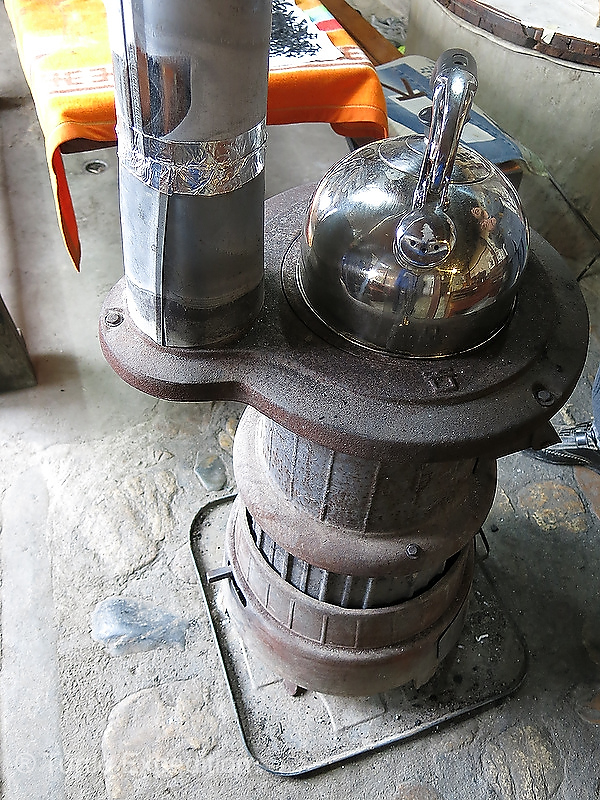 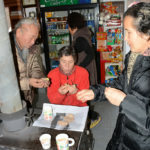 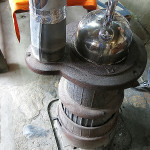 He invited us for tea and oven roasted sweet potatoes in his shop. 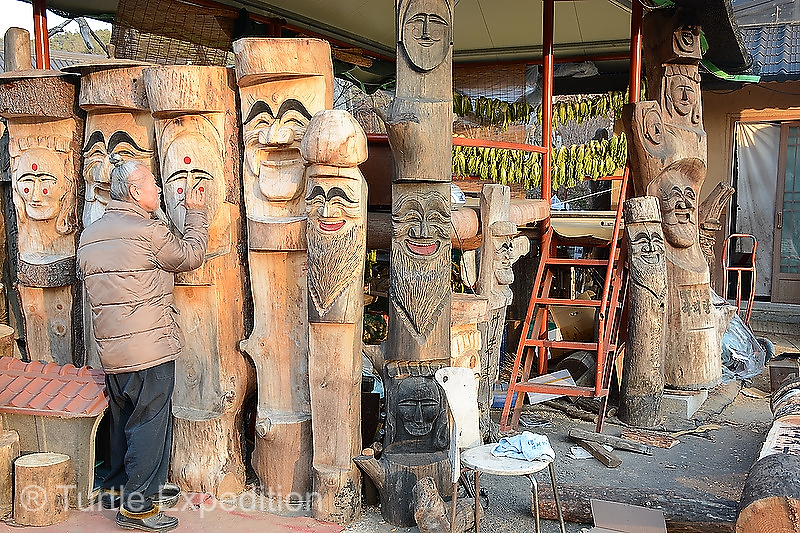 After meeting his family and seeing his many carvings he kindly presented us with the token gift, a smaller version of his large totem poles more suitable for packing in our truck. 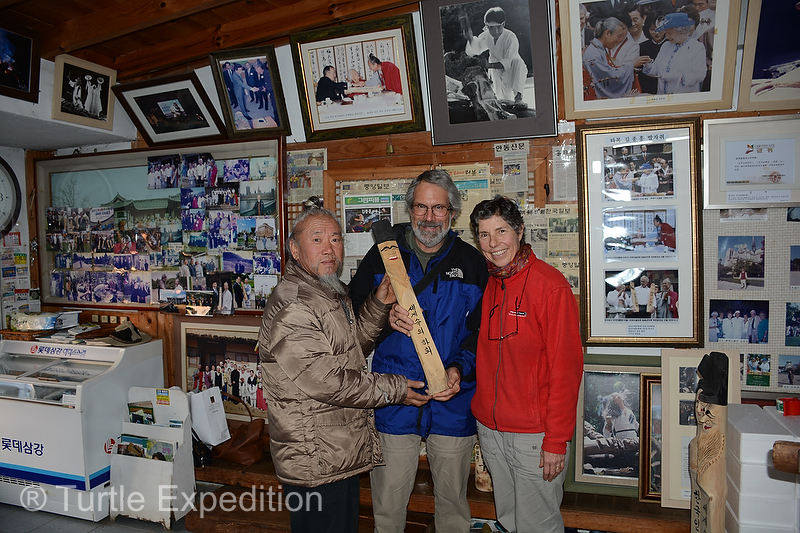 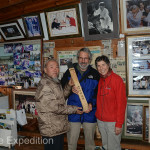 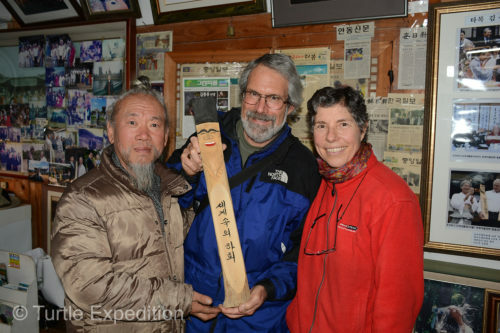 Mr. Kim Jong-heung carefully selected a special carving for us to take home to California. 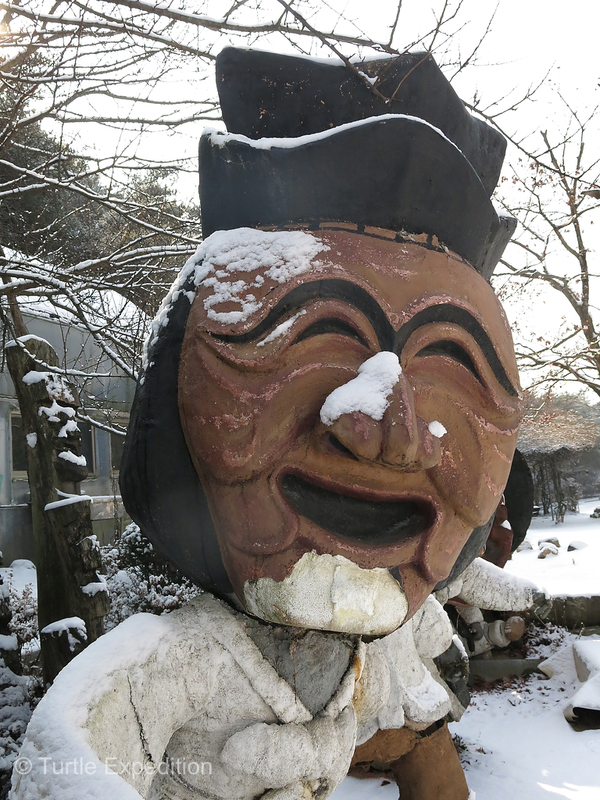 Adjacent to the visitors’ parking lot we also discovered a fabulous mask museum. 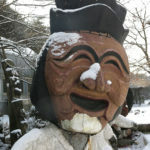 The masks were not only from Korea but from all around the world. 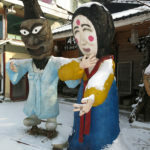 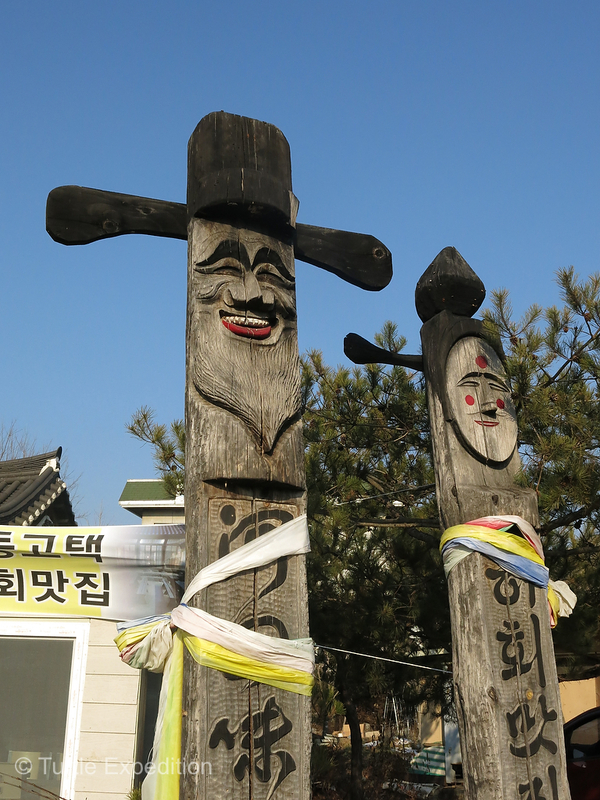 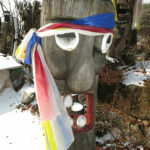 Decorated wooden statues were placed all around Hahoe village. 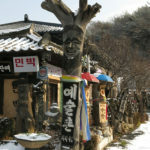 At the entrance of the Hahoe area were Mr. Kim-Jong-heung and several souvenir shops. 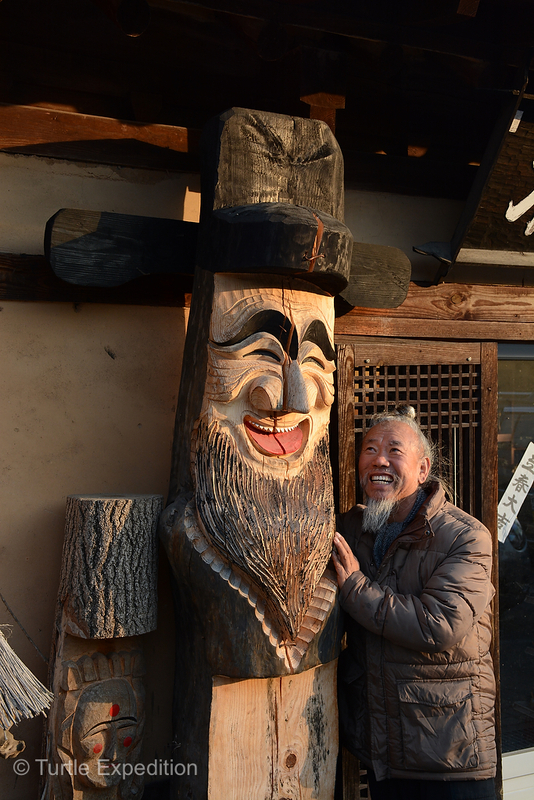 It was fun walking through Mr. Kim Jong-heung work shop which was full of statues of various sizes and shapes. 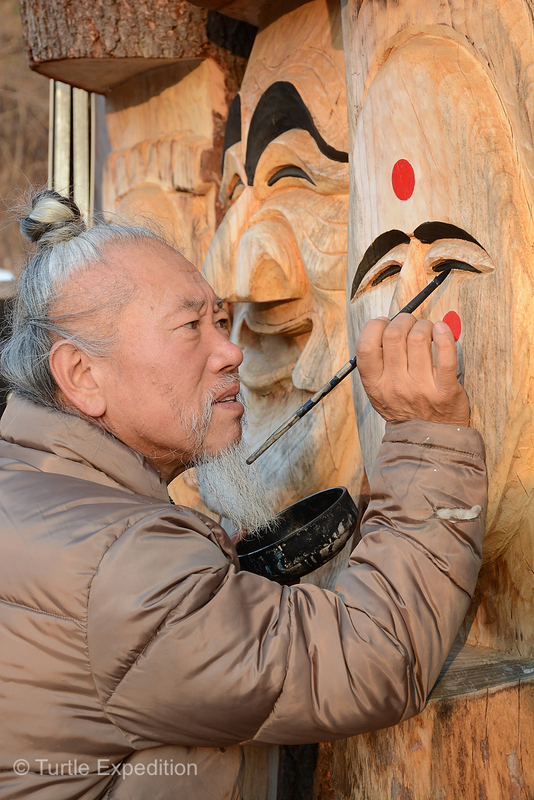 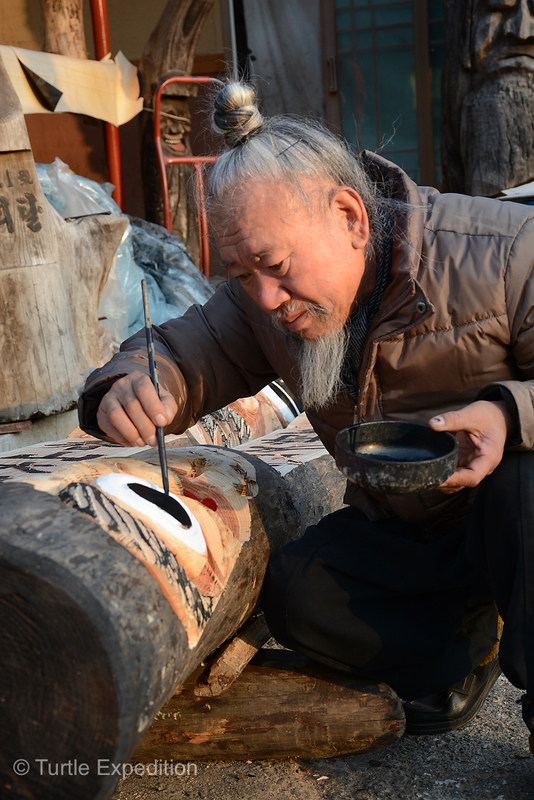 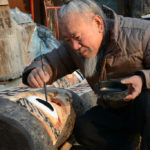 After carving his sculptures, Mr Kim Jong-heung adds the final color touches. 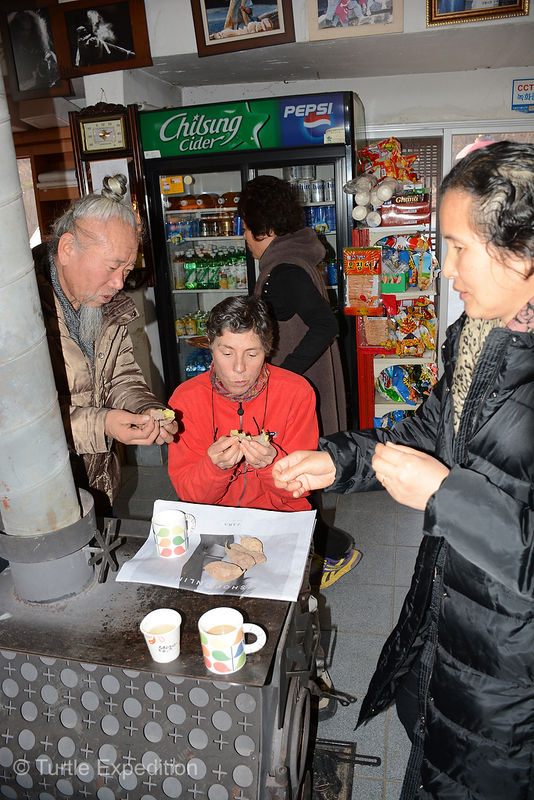 Monika is tasting the delicious pot belly stove baked sweet potatoes. 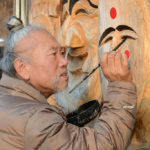 Mr. Kim Jong-heung is personalizing our carving with a special message. 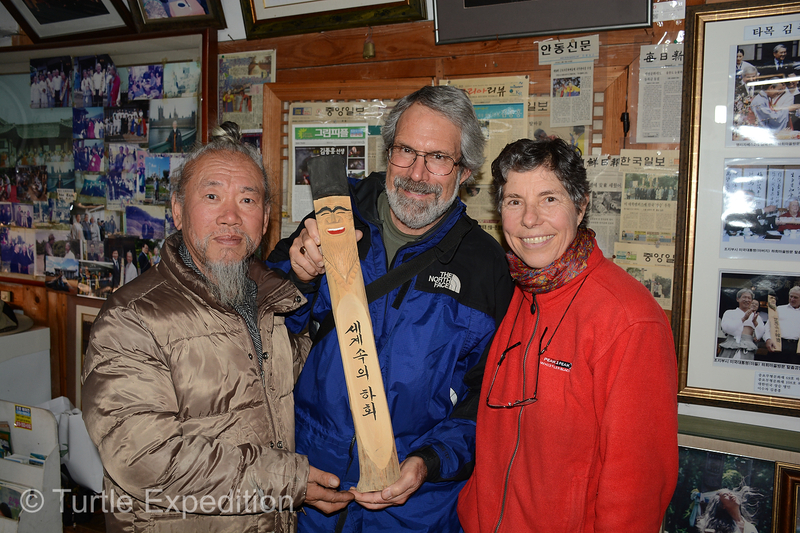 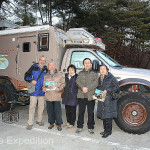 Mr. Kim Jong-heung presented us with a small example of his art, just the right size for travel. 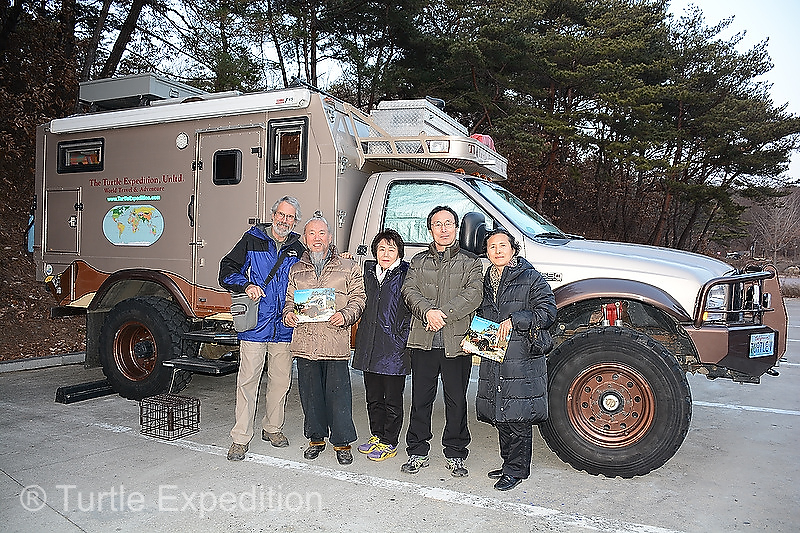 A group photo of Mr. Kim Jong-heung and his family was a must. 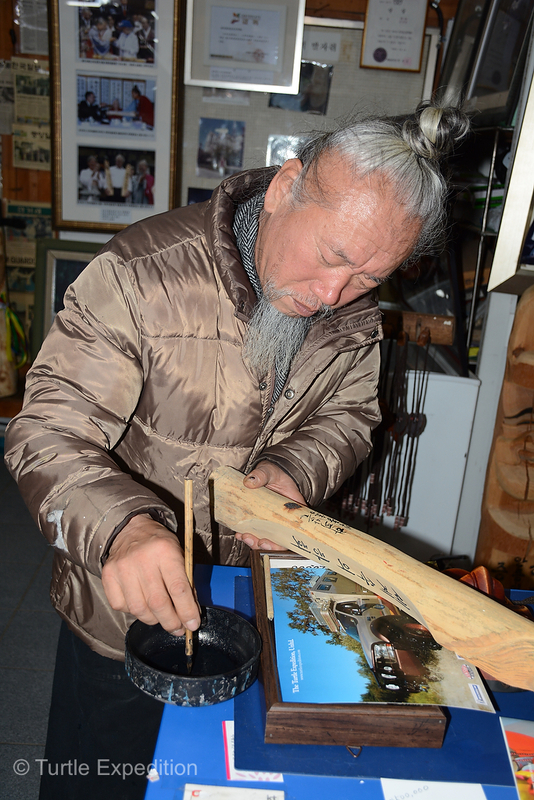 We made a print for him with our travel printer. 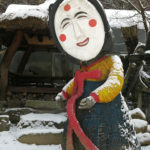 Monika wanted to take Pune, the concubine, home and put it in her garden. 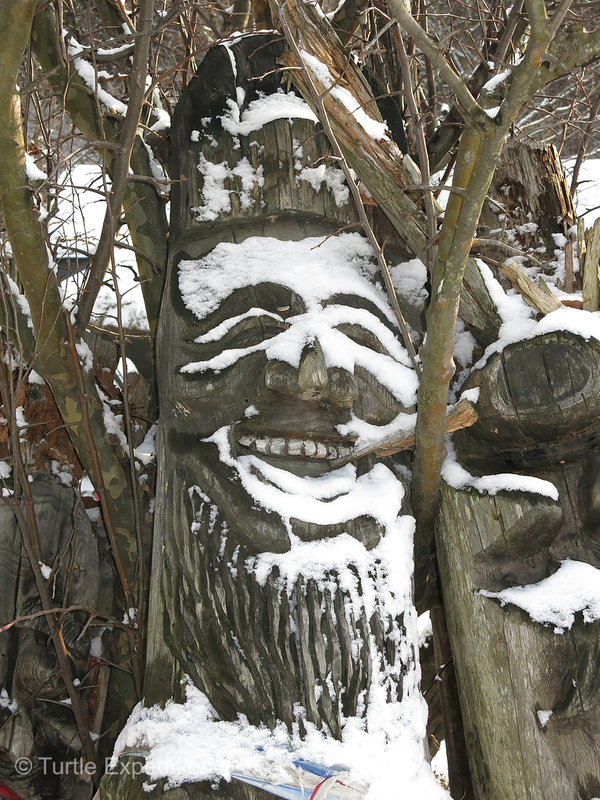 A dusting of snow gave the sculptures even more character. 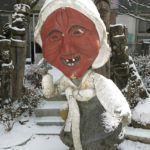 This was Yungban, the aristocrat. 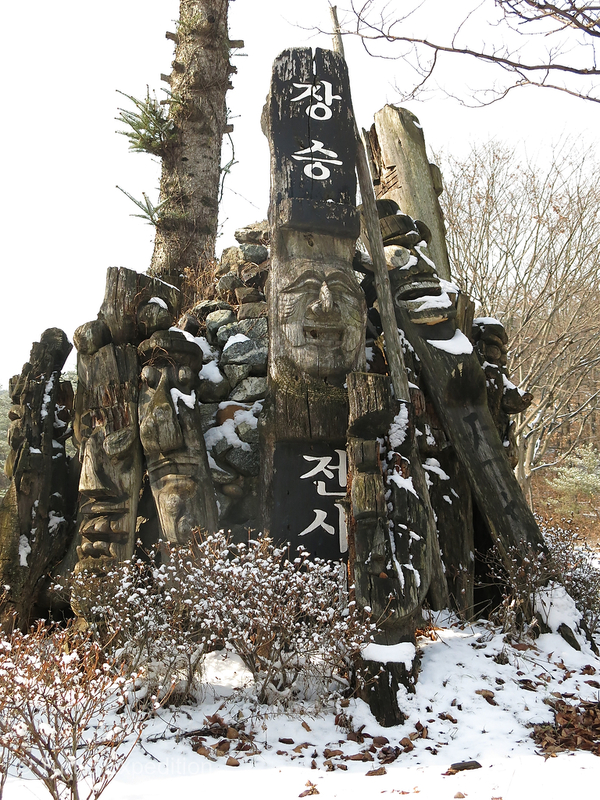 A cluster of carvings around a carefully stacked pile of rocks. 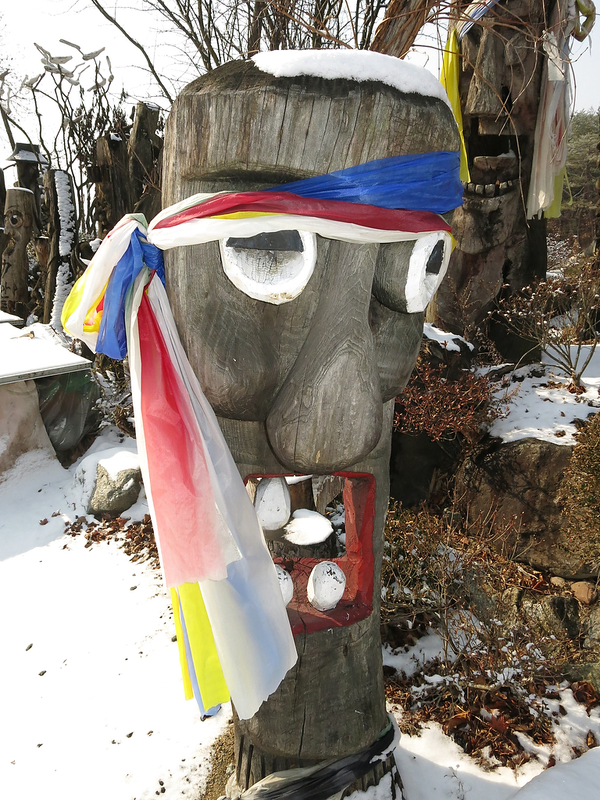 It could have religious significance. 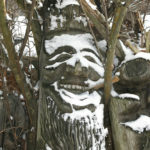 This guys just made us laugh. 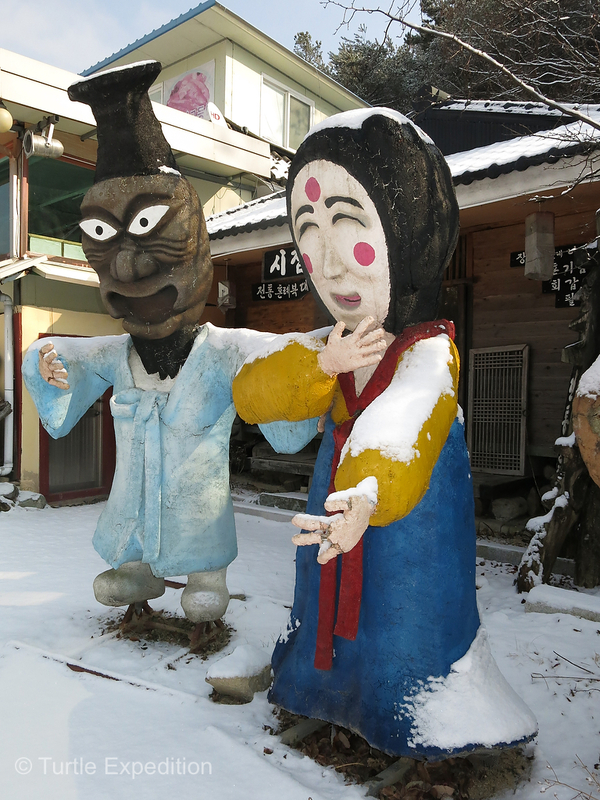 These two statues were greeters in Hahoe. 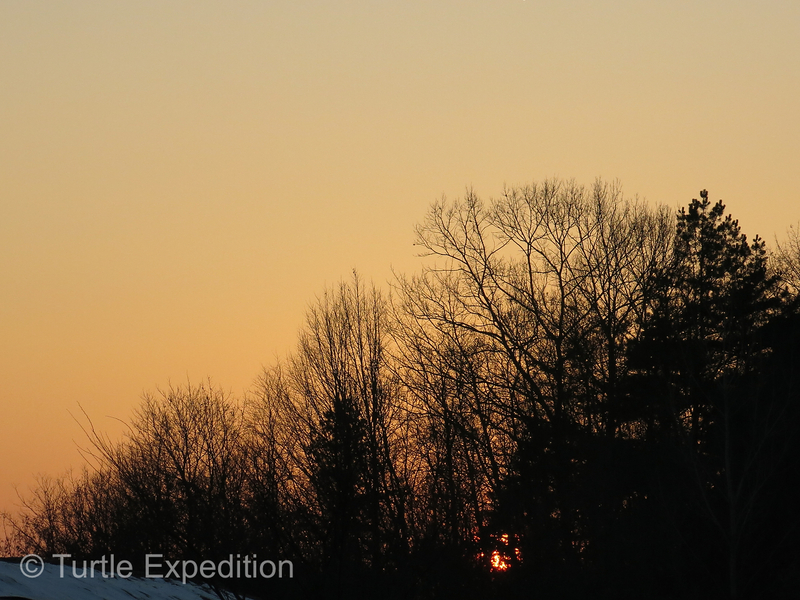 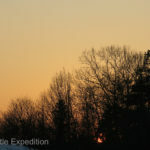 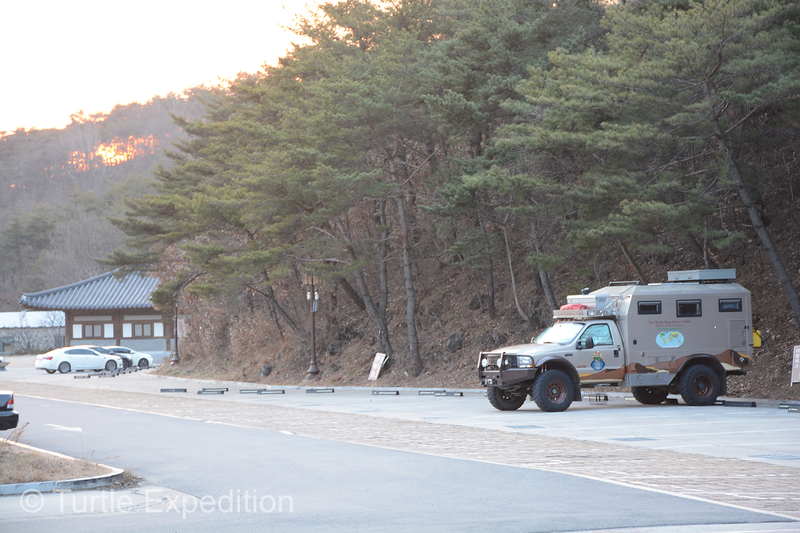 During the night, the parking lot was empty and quiet, not that there were many tourists in December.